PROHEALTH NAMED TOP WORKPLACE 2019 - ProHealth Partners, Inc. The top-notch ProHealth team provides quality in-home health care services to many communities in Ohio and Michigan, and it is because of each team member that this company was considered for this prestigious award. 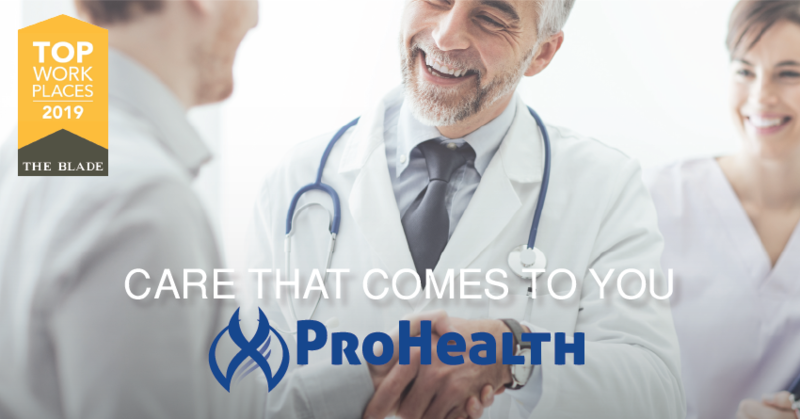 ProHealth would not be where it is today without your expertise, compassion, talent and commitment to improving our patients’ quality of life through comprehensive in-home health care services. You work tirelessly through changes and challenges to improve the field of home health care, sharing the common goal of providing outstanding clinical care and positive patient experiences and ensuring that our patients remain safe, healthy and have an ever-present sense of dignity. You are grace exemplified in the many lives they touch every day. You are all heroes. And we are honored to have you on the ProHealth team.